So far we have been working on controlling individual pins on the Induino R3. Now we will explore as to how we can use groups of pins together. Pins of a microcontroller are normally grouped together as PORTS. Each PORT can have 6 - 8 Pins (Though 8 Pins is pretty much the standard!). We can control each of these Ports using associated registers and this process of controlling a whole port instead of individual pins is called Port Manipulation. PORT => This Register is a Output Register and all Output states of a pin are written to this register. PIN => This is a Input Register and Read Only. This register contains the current state of pin configured for Input. 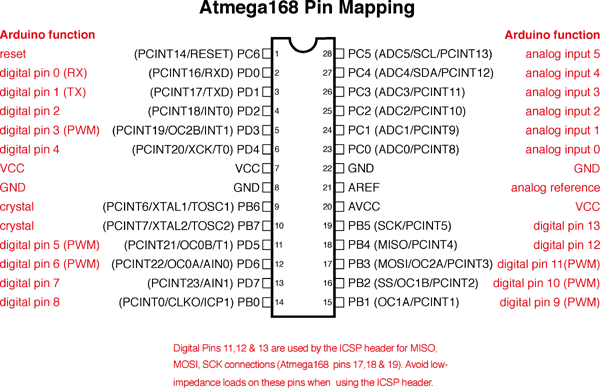 The following are the registers associated with the 3 PORTS of the ATmega328. Note: Incase of a Board like the Arduino Mega 2560 there are more Ports however the naming convention for the registers will be the same as the above. In the table above, in the Register DDRD is a 8 bit register with the least significant bit representing pin 0 and the most significant bit representing pin 7. Now in this register the 7th pin is configured as OUTPUT and the remaining pins are configured as INPUTs. When you use the pinMode function, this is the register that gets modified based on the pin number you specify. The PORTD register has the 7th pin set as a HIGH. This is the register that gets modified when you use the digitalWrite function. Note, The 6th Pin is a Input pin and setting this as HIGH enables the Internal Pullup resistor. The remaining pins are in their default state - LOW. The PIND register has the value pertaining to the current state of the PIN. In this case it would have HIGH for the 6th & 7th pins, as they've both been set to HIGH in the PORTD register. However if there is a button connected to PIN 6 (which is configured as INPUT), the value of the 6th pin would vary everytime the button is pressed. Lets try a blink program example that uses Port Manipulation. Lets try to Blink all the 3 LEDs on pins 11, 12 & 13 at the same time. 7-Segment displays are another common component in the world of electronics. 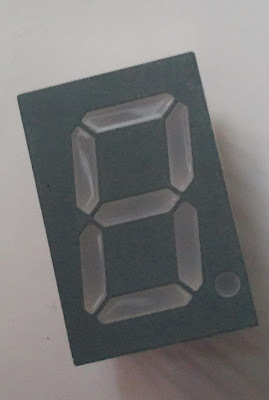 These displays have 8 LEDs split into different segments designed to be able to display numerals from 0-9 and a dot. All The LEDs have a common ground / supply line. There are 5 pins at the top and 5 pins at the bottom. 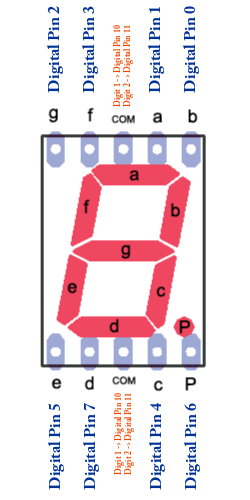 The middle pins in the top and bottom are connected to each other internally and have to be connected to Ground / Supply depending upon the type of the 7-segment Display. You can control each segment like an individual LED. We shall use Port Manipulation to Control these as a set. This shield lets you experiment with DTMF or 7-Segment Displays (You can use only one of these at any given time). Check here for how to work with the DTMF part. The shield lets you control up to two Common Cathode type 7-Segment Displays. The shield provides you with options to control the COM pin of the 7-Segment Displays using either an IO or by connecting the COM pin Directly to Ground through a set of jumpers. COM pin of the Digit 1 can be set to be controlled by Digital Pin 10 and COM pin of the Digit 1 can be set to be controlled by Digital Pin 11. See the image below. First Lets try to Control one of 7-Segment Displays. Set the jumper to connect the COM pin of display 1 to ground. (Refer to Jumper Settings image above). You can either remove the other display or set the jumper for it to connect its COM pin to the IO. Now that we are all set, lets understand what we are about to do. If you noticed, we have used all pins on PORT D to connect to the segments of the 7-Segment Display. This will help us control all the segments at once. To display the number '1' on the 7-segment display, we need to make the segment 'b' (digital Pin 0) & 'c' (digital Pin 4) high and keep all other segments low. We are going to store the above decimal values in an array such that the 0th element of the array will hold the value '187' which is the value to be written to the output register to produce a '0' on the 7 segment display. So anytime we want to display a numeric value, we simply call the array variable with the value of the digit we want to display. Try the following program. You should see numbers from 0 to 9 being displayed. Ensure you set the jumpers of the Displays to have the common pin connected to GND. // An array variable to store the decimal values to be written to the PORT register to produce various digits on the 7 segment. // Set all the pins from 0 to 7 as output. To produce multiple digits, we are going to control the common pin and change the values displayed on each of the digits at very high speed so that it appears to the viewer as if a multi digit number is being displayed constantly. Lets see how to display the number 23. // A for loop to add stability to the display - the display looks more stable if the same value is displayed for more number of times at a higher speed. Heres how we are going to do it. Then Display the number of the ones value on the display 1 for a short amount of time (very short!). Now Display the number of the tens value on the display 2 for a short amount of time (very short! ).